Carotenoids are red, yellow and orange pigments that are widely distributed in nature. Hydrocarbon carotenoids are classified as carotenes (e.g., beta-carotene, alpha-carotene, lycopene), while those containing oxygen are known as xanthophylls (lutein, zeaxanthin, beta-cryptoxanthin). To date, only 14 carotenoids have been identified in human blood. Blood concentrations of all carotenes / carotenoids tend to be constant and slow to change during periods of inadequate dietary consumption. The estimated half-life of carotenes / carotenoids is between 11 and 14 days. You can get all the carotenes / carotenoids you need, from your diet. Carotenes are found in yellow and orange vegetables. 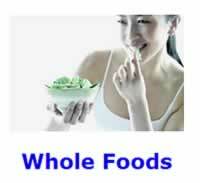 Most of the non-carotene carotenoids are found in green leafy vegetables. Carotene / carotenoid rich vegetables are best consumed cooked, with extra virgin olive oil or some other fat. In animals, some carotenoids (particularly beta-carotene) serve as dietary precursors to Vitamin A, and many of them may function as fat-soluble antioxidants. In plants, carotenes serve as antioxidants to protect the highly reactive photosystems and act as accessory photopigments. In vitro experiments have shown that lycopene, alpha-carotene, zeaxanthin, lutein and cryptoxanthin quench singlet oxygen and inhibit lipid peroxidation. The isolation and identification of oxidized metabolites of lutein, zeaxanthin and lycopene provide direct evidence of the antioxidant action of these carotenoids. Because major effects of carotenoids and other antioxidants take place at the cellular level, evidence of bolstered protection requires testing for plasma antioxidant levels and for markers of cell damage. The benefits of an adequate intake of carotenes, carotenoids and other antioxidants only become apparent in the long term, when reduction in oxidative damage results in lowered incidence and severity of chronic diseases. Overall, 80-85% of carotenes and carotenoids are stored in fatty tissue, with smaller amounts found in the liver, muscle, adrenal glands and reproductive organs. Approximately only 1 percent circulate in your blood, on HDL and LDL. As fatty tissue store most of the carotenes and carotenoids in your body, blood concentrations tend to be constant and slow to change during periods of inadequate dietary consumption. The estimated half-life is 11-14 days for lycopene, alpha-carotene, beta-carotene, lutein and zeaxanthin,. This leads me to believe that anyone can get all the carotenes that they need, from their diet. You would have to stop eating carotenes / carotenoids for almost two weeks, before your blood levels of them would fall to half their original concentration levels. This is NOT at all how it works for Vitamin E. Consistently high blood levels of vitamin E requires the daily consumption of nuts, or alternatively supplementation with vitamin E supplements. Carotenes and carotenoids on the other hand do not, once you have saturated your fatty tissues with them. Getting carotenes from your diet is, also, quite easy to do. All that you have to do is to include in your diet the foods that contain the highest concentrations of the major carotenes and carotenoids. Along with the major carotenoids, you will also get all the minor carotenoids contained in these same foods. Approximately 80-90% of the carotenoids present in green, leafy vegetables such as broccoli, kale, spinach and brussel sprouts are xanthophylls, whereas 10-20% are carotenes. Conversely, yellow and orange vegetables including carrots, sweet potatoes and squash contain predominantly carotenes. The major carotenoids are as follows. ALPHA-CAROTENE - This carotenoid is similar to beta-carotene in its biological activity, but quenches singlet oxygen more effectively. Alpha-Carotene improves gap junction communication, prevents lipid peroxidation and inhibits the formation and uptake of carcinogens in the body. High serum levels have been associated with lower risks of lung cancer. The best food sources are: carrots and pumpkin. Other dietary sources include sweet potatoes, apricots, cantaloupe, green beans, lima beans, broccoli, brussel sprouts, cabbage, kale, kiwi, lettuce, peas, spinach, prunes, peaches, mango, papaya, and squash. 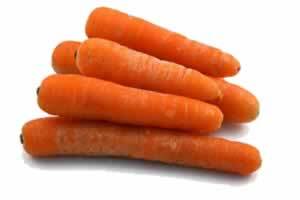 BETA-CAROTENE - This carotenoid is the major source of dietary Vitamin A, due to its high provitamin A activity. High serum levels of beta-carotene are correlated with low incidences of cancer in the mouth, lung, breast, cervix, skin and stomach. The best food sources are dried apricots, carrots, and dried peaches . Other dietary sources include mango, cantaloupe, pumpkin, papaya, prunes, squash, sweet potato, cabbage, lima beans, green beans, broccoli, brussel sprouts, kale, kiwi, lettuce, peas, spinach, tomatoes, pink grapefruit, honeydew melon and oranges . LUTEIN - This xanthophyll exists in the retina. It functions to protect photoreceptor cells from light-generated oxygen radicals, and thus plays a key role in preventing advanced macular degeneration. Lutein does not possess provitamin A activity. The best food sources are kale, collard greens, spinach, and all greens in general. Other dietary sources include mango, papaya, oranges, kiwi, peaches, squash, peas, lima beans, green beans, broccoli, brussel sprouts, cabbage, lettuce, prunes, pumpkin, sweet potatoes and honeydew melon. ZEAXANTHIN - Besides lutein, zeaxanthin exists in the retina and confers protection against macular degeneration. This xanthophyll does not possess provitamin A activity. The best food sources are kale, collard greens, spinach, and all greens in general. Other dietary sources include peaches, squash, apricots, oranges, papaya, prunes, pumpkin, mango, kiwi, lettuce, honeydew melon and yellow corn. LYCOPENE - In experiments performed in vitro, lycopene quenched singlet oxygen more efficiently than alpha-carotene, beta-carotene, zeaxanthin, lutein and cryptoxanthin. The red color of fruits and vegetables such as tomatoes, pink grapefruit, the skin of red grapes, watermelon and red guavas is due to lycopene. Lycopene is not converted to Vitamin A in vivo. The best food sources are tomato juice, tomato paste, and pink grapefruit. Other dietary sources include the skin of red grapes, watermelon, red guavas, papaya and apricots. BETA-CRYPTOXANTHIN - Beta-Cryptoxanthin can quench singlet oxygen. It is used to color butter. Beta-Cryptoxanthin exhibits provitamin A activity. The best food sources are papaya, and dried peaches. Other dietary sources include oranges, mango, cantaloupe, prunes, and squash. Several factors influence the bioavailability of carotenoids obtained from food: Cooking disrupts cellular membranes and liberates nutrients. Carotenoids are absorbed more efficiently from cooked versus raw foods . So, for maximum bioavailability lightly steam all vegetables (but not dried fruit). You should, also, consume them in a meal that contains extra virgin olive oil, or some fat. If your meals center around whole-grains, such as rice or pasta, it is a simple matter to add a couple tablespoons of tomato paste, a tablespoon of pumpkin paste, or a couple tablespoons of chopped carrots, and olive oil to the sauce. A few scoops of some type of chopped canned greens, such as kale, can also be easily added (the secrete is to add only a small amount) to every meal. This way by the end of the week you would have easily consumed ten or so servings of carotenoids. Raw and steamed carrots, dried apricots and peaches, and steamed spinach can easily be added to salads. Alpha-Carotene, beta-carotene and beta-cryptoxanthin can be converted to Vitamin A in the intestine and liver. Vitamin A is essential for the immune response and is also involved in other defenses against infectious agents. Nevertheless, in many individuals, this conversion is slow and ineffectual, particularly as you get older. In a recent study, increases in blood beta-carotene levels did not result in a corresponding increase in blood Vitamin A levels,. Some individuals are known as non or low-responders because they do not convert beta-carotene to Vitamin A at the expected rate. A number of factors can inhibit this conversion of Beta-carotene to Vitamin A. The major reason why so many Americans have a poor vitamin A status is the regular consumption of excessive amounts of alcohol. Intestinal parasites can be a factor. And, any prescription drug that requires liver metabolism will decrease the liver conversion of beta-carotene to retinol in the liver. Diabetics and individuals with hypothyroidism or even borderline hypothyroidism are likely to be low-responders. Everyone should supplement with a tiny amount of vitamin A, or retinol, on a weekly basis in order to prevent chronic infections. Isler, O., editor. (1971) Carotenoids. Birkhauser Verlag, Basel. O'Neil, C.A. and Schwartz, S.J. (1992) Chromatographic analysis of cis/trans carotenoid isomers. Journal of Chromatography 624:235-252. Khackik, F. et al. (1995) Lutein, lycopene and their oxidative metabolites in chemoprevention of cancer. Journal of Cellular Biochemistry, Supplement 22:236-246. DiMascio, P. et al. (1989) Lycopene as the most efficient biological carotenoid singlet oxygen quencher. Archives Biochimica et Biophysica 274:532-538. Bendich, A. and Olson, J.A. (1989) Biological action of carotenoids. FASEB Journal 3:1927-1932. Rock, C.L. et al. (1992) Plasma carotenoid levels in human subjects fed a low carotenoid diet. Journal of Nutrition 122:96-100. Micozzi, M.S. et al. (1992) Plasma carotenoid response to chronic intake of selected foods and beta-carotene supplements in men. American Journal of Clinical Nutrition 55:1120-1125. Micozzi, M.S. et al. (1990) Carotenoid analyses of selected raw and cooked foods associated with a lower risk for cancer. Journal of the National Cancer Institute 82:282-285. Zhang, L.X. et al. (1991) Carotenoids enhance hap junctional communication and inhibit lipid peroxidation in C3H/10T1/2 cells: Relationship to their cancer chemopreventive action. Carcinogenesis 12:2109-2114. Schalch, W. (1992) Carotenoids in the retina - A review of their possible role in preventing or limiting damage caused by light and oxygen. EXS (Supplementum to Experientia) 62:280-298.